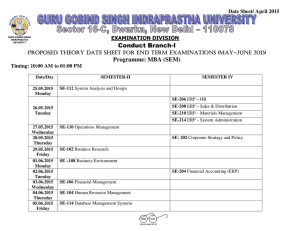 provided to demonstrate the application of I-ERP. © 2018 by the authors; licensee Growing Science, Canada. © 2019 by the authors; licensee Growing Science, Canada. knowledge for their users, which increases user learning ability (Bendoly et al., 2009). adapting business rules (Rizza, 2016). periods, reduce costs, accelerate fund turnover, and increase production and service quality (Ma, 2009). be an effective management tool in the future (Horakova & Skalska, 2013; Kahraman et al., 2011). • Effectiveness of I-ERP system for quality improvement of the company’s operation. flexibility, and cost (Thomas et al., 1985). is reported to be more than 30,000. See the Fig. 1. Resource Planning systems (Kahraman et al., 2011). 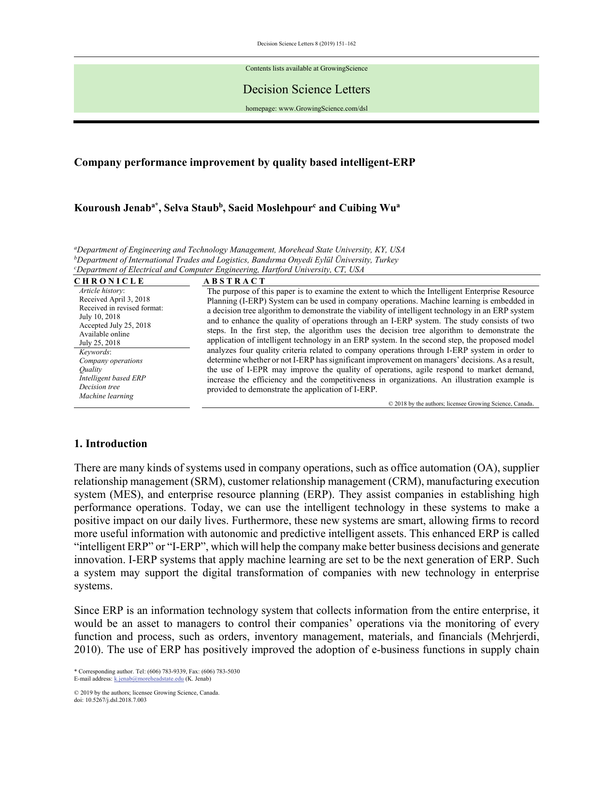 This study connects BI and ERP systems to assist enterprise managers in making effective decisions. exceptions and business rules with the collected data (Ledford, 2017). Company operations keep the company running and generating revenue through its core processes. as depicted in Fig. 2 (Sanders, 2014). makeing sure that their works leads to high quality in all operations (Balle, 2015). are three types of machine learning algorithms as shown in Fig. 3 (Ray, 2017). used. The training data is shown in Table 1.
conditions shown in Table 2, we can change Table 1 to Table 3. Step 3. Calculate the expected information of the classified data samples selected. The expected information needed to classify a given sample is given in Eq. (2). In this step, we select the Profit. For the node, there are three groupings: 4 Great, 5 Good, and 5 Pass. voting method, we can receive the result that when Income is Good, EVA is 4 Good, as shown in Fig. 6. Then Expense can be selected for the next node of the decision tree. The result is depicted in Fig. 7.
purchase receipt functions, monitoring inventory, as well as work order processing in manufacturing. the data is in one system. The manager can utilize I-ERP to make competitive business decisions. cycles accelerate inventory turnover, thus reducing costs and improving the capital utilization ratio. that is calculated as the average inventory over sales or cost of goods sold. efficient operations. Thus, the I-ERP system becomes an attractive planning tool for managers. inventory processes. These functions can help a company improve the speed and quality of operations. be available for mobile devices as well. The ERP system helps decrease the cost of operations and management with the use of real-time data. implemented ERP system can save much money. A cost comparison of Pre-installation and Postinstallation ERP systems is conducted below (Table 4 and Fig. 8), using a data set from a sample firm. help managers to devise plans to ensure optimal inventory with maximum cost reductions. of operations, meet market demands, increase efficiency, and improve product competitiveness. 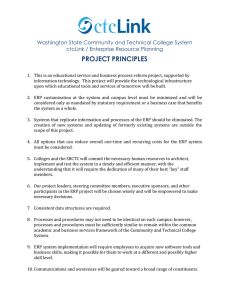 exploration of the I-ERP system. advantage: A data envelopment analysis. Journal of Operations Management, 27(4), 310-323.
organizations and society, 34(2), 151-169.
benefits. Decision support systems, 46(1), 149-157.
of the Transilvania University of Brasov. Economic Sciences. Series V, 1, 259.
organization: SAP-LAP framework. International Journal of Organizational Analysis, 18(1), 151-166.
management. Journal of Enterprise Information Management, 24(4), 360-379. Kaniadakis, A. (2012). ERP implementation as a broad socio-economic phenomenon: The agora of technoorganisational change. 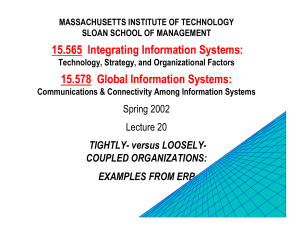 Information Technology & People, 25(3), 259-280.
system. International Journal of Production Research, 47(7), 1913-1929.
analog electrical circuits using genetic programming. In Artificial Intelligence in Design’96 (pp. 151-170). Ma, Y. (2009). Research on the ERP/MES management system for dalian dituo zhonggong co.ltd (Order No. H282208) (1026764042). Retrieved from http://search.proquest.com/docview/1026764042?accountid=458. (Order No. 3523280). Available from ProQuest Central; ProQuest Dissertations & Theses Full Text. Moln.r, B., Szab., Gy., & Bencz.r, A. (2013). Selection process of ERP systems. Business Systems Research, 4(1). frameworks in supply chain integration. International Journal of Production Economics, 113(2), 721-733. Rizza, M. N. (2016). The Rise of Intelligent ERP (i-ERP). 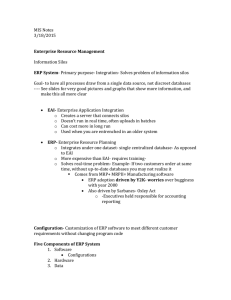 Retrieved from https://idccommunity.com/groups/it_agenda/bigdataanalytics/the_rise_of_intelligent_erp_i_erp. system. International Journal of Recent Trends in Engineering, 2(3), 1. Seddon, P. B. (2005). Are ERP systems a source of competitive advantage?. Strategic Change, 14(5), 283-293.
for Information Systems Electronic Library (AISeL), Americas Conference on Information Systems (AMCIS). Simonite, T. (2017). Microsoft says its racist chatbot illustrates how AI isnt adaptable enough to help most businesses. and Operations Management, 16(2), 203-216. Wu, J.Y. (2010). Computational intelligence-based intelligent business intelligence system: concept and framework. 2nd International Conference on Computer and Network Technology, ICCNT 2010, pp. 334-338.